Disclaimer: This is a sponsored post. All words and opinions expressed are 100% our own. Being a fit family has always been one of our priorities, especially because I grew up with a dad who has always taught us the importance of being fit and active. Our main way of staying healthy and active has always been running. I was first introduced to the New York Road Runners Club at the age of 12 years old when I participated in my first mini race. It would be the first of many races. A few weeks ago the opportunity to team up with the NYRR which holds a special place in my heart, came up and it couldn't be passed up. We would get to check out one of their Family Running Classes, the perfect way to end a weekend. The family running classes are a part of the Rising New York Road Runners and it is just one of the many free programs that they offer at the NYRR Run Center located 320 West 57th Street. The New York Road Runners has been offering free youth running and fitness programs to kids who love to run, all across the country by teaching them to be more active and inspiring them via running. There's no other feeling like the one you feel after you cross that finish line to the race that you've been training for. Being a member of NYRR for 20+ years means that I've had the opportunity to see them evolve and that no matter what, they've always kept the mission of Fred Lebow (co-founder of the NYC Marathon and the NYRR) alive, who believed that anyone can run! It was also my first time seeing the new location for the running hub, the old location used to be on the upper east side. A very exciting and emotional Sunday for sure, I got to share this experience with my dad who thought me to love running. We started the morning with an introduction from the two coaches who would guide us through the Family Running class. They explained how the classes worked. We would first do some warm ups, and learn some proper running techniques. Always a good refresher for runners, I needed it for sure. We would then head to Central Park where we would do some running exercises. The warm ups are always great to help loosen up if you feel a little bit nervous, sometimes trying something new can be out of your comfort zone but NYRR makes it easy to feel at ease right away. Not only that but your little ones will love imitating mom or dad and have fun while working up a nice sweat at the same time. I'm not going to lie when I say that it took Valentina a lot of time to feel comfortable in the class and by that I mean that she just watched from the side lines, ha! She did promise to participate next time. After doing some fun warm ups for about 15 minutes we then headed to the park, it was a chilly day and decided to take our coats with us. At the park was where it got more fun and interesting, especially if you go with friends and other family members like cousins and siblings, or friends from school. It was about 35 minutes of relay races, jumping exercises and racing friends to see who would get their first, well that's what Shirley (pictured above) and I did. It was a blast watching our daughters and family cheer us on and then do the same as they raced each other in a friendly way. The time went by faster then expected and before we knew it the class was over and we had worked up a nice sweat. That's the great thing about the NYRR Family Running classes is that you don't know that you are working out until you notice the sweat dripping or you feel a little bit out of breath. The kids were all laughter and happiness, they thought it was great to be doing exercises and running around in the park. Something that the Family Running Class reminded me was that as long as you make it fun and never pressure your kids, they will always have fun and want to join you again. 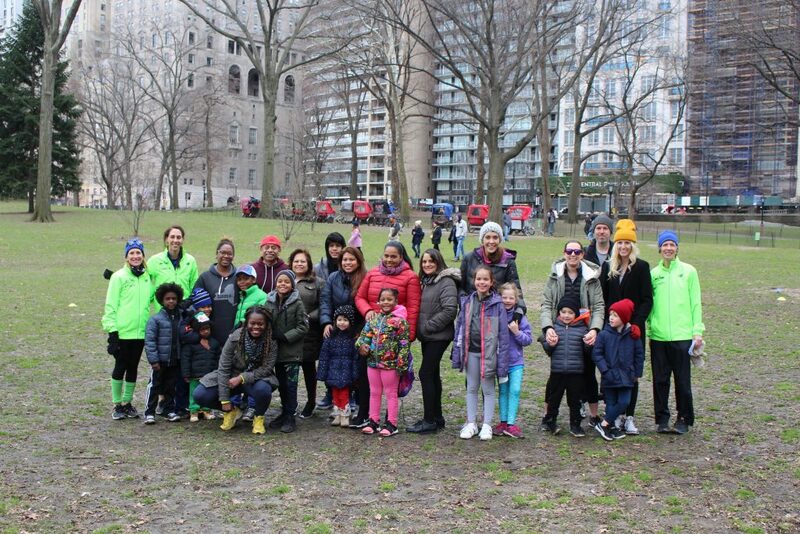 Working out as a family has never been more fun thanks to the NYRR and coaches. As you can see in the picture above, we were all smiles. It really was a fun morning with other fellow bloggers, one that will be cherished. You can register for an upcoming FREE Family Running class here. The next class is this upcoming Saturday and you still have time to sign up. Everyone knows that you can't work out properly if you are not wearing the proper shoes. We got to hear from a shoe expert and learn about the importance of picking out the perfect running shoe, one that is fitted especially for you. He talked about neutral shoes, support shoes and how important it is to know whether you are an over pronator, inside pronator or whether you have high arches. A few years back I got to visit a running shop and get fitted for running shoes, that's where I was told that I was an inside pronator, therefore a shoe with cushioning is what was my feet needed. A few years later and I was reminded of the importance of wearing the proper shoes, especially when running. We all got to get our foot evaluated and the best part was that Valentina was fitted for her first official running shoe. Now to sign her up for her first race. You don't need to be running a race to stop by the New Balance Run hub to talk to an expert, just stop by and anyone that's on the showroom located on the second floor can help you out. 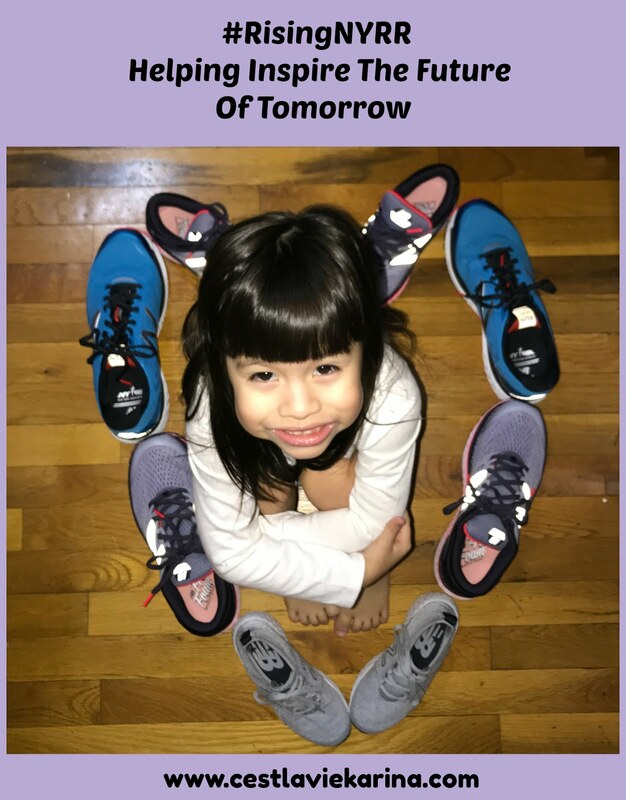 If you do end up buying yourself a pair of shoes, you will be making a difference thanks to the 1 for You 1 For Youth programs that they have. We are proud members of the NYRR, and one thing that I've always loved about the them is that they've continued sharing the people of NYC how special running is, continuing to follow the founder Fred Lebow message "That anyone, can run!" So take out those negative thoughts, if you have any or put toss those "I can't" thoughts into the garbage and tie up those laces as go out the door for a nice slow run. If I can do it, then you surely can. Running is the one sport that I can tell you for sure will embrace you with open arms, it is a community of support and you will find nothing but big high fives and thumbs up as you begin your journey. Running is not based on beating the person in front of you, it is based on being the best that you can be and beating that personal record which ever it may be.